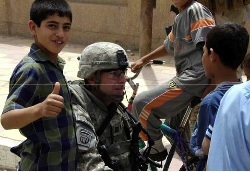 There are a good variety of interesting and successful stories – school supplies delivered; a new academy to help train Diyala IP; and an ice cream incentive to children to clean up streets! Many criminals and terrorists captured or killed, and quantities of weapon caches uncovered, many from Iran. 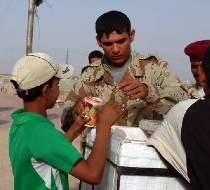 BASRA – During the morning of April 21, Iraqi Soldiers along with 504 PIR, 82nd Abn Div Soldiers participated in a joint humanitarian aid mission in the Tannumah district of Basrah. Various school supplies, ranging from backpacks, notebooks and soccer balls were handed out by the Iraqi soldiers, while 504 PIR helped with security in the area. Col. Abas stated, in a meeting after the event, “Providing these children with much needed supplies helps us further our connection with the local people. For helping these 1,500 children, news will spread to 1,500 fathers and mothers.” COL Abas, with the help of 4th Plt, is planning more school supply handouts and a possible MEDCAP. U.S. Army Capt. Williiam Chesher, cmdr. 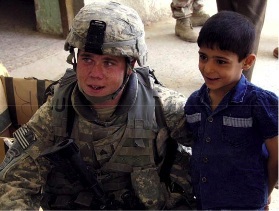 of Delta Co. talks to Iraqi children. BAGHDAD – Soldiers from 4th BCT, 10th Mtn Div, and IA soldiers were attacked by 6 mortars at approx. 6 p.m., April 24 at their JSS in northeastern Baghdad. Soldiers located a 3-man mortar team and engaged the criminals, killing all 3. No Soldiers were injured. At approx. 10:10 p.m., an AWT spotted criminals digging by a road in northeastern Baghdad. The AWT engaged the criminals with a hellfire missile, killing 2. At approx. 1 a.m., April 25, an AWT spotted 4 criminals emplacing an IED in northeastern Baghdad, and engaged the criminals with a hellfire missile, killing all 4 and destroying the IED. An AWT witnessed 2 criminals setting up a firing position in northeastern Baghdad at approx. 1:30 a.m., and engaged with a hellfire missile and killed one criminal. The other criminal fled to a nearby building. The AWT could not engage the second criminal due because of innocent civilians in the area adjacent to the building. FOB LOYALTY – Acting on intel reports, Iraqi Security and CF initiated a combined op to search for weapons caches at a psychiatric hospital in eastern Baghdad, April 24. The NP found nothing significant to report at the hospital; however, while searching the neighborhood, they did recover 3 rocket rails. During the joint op, the NP and U.S. Soldiers were attacked by 4 IEDs, 2 mortar attacks; they recovered 2 IEDs and were involved in 4 small-arms fire engagements. Iraqi Security and CF killed an IED triggerman. Also, an AWT killed 3 Special Groups criminals when they attacked the patrol. .
BAGHDAD – In the Rashid district in southern Baghdad April 22, Soldiers from Co A, 1st Bn, 22nd Inf Regt, 1st BCT, 4th ID, discovered 4 Iranian-made 107 mm rockets, during the effort to provide a safe and secure environment to the 1.2 million Iraqi citizens who reside in the district. “The 1st BCT, or “Raider” Bde, continues to conduct daily combat patrols with Iraqi SF to minimize violence, and remains committed to the welfare of the Iraqi people,” said Maj. Dave Olson, 1st BCT spokesman. BAQUBAH – As the situation in Diyala continues to improve, the mission is changing from clearing the province of AQI, to ensuring it remains secure and free of terrorist elements. The improved security has allowed the IP to focus on other issues. One of the larger issues the force is addressing is the training of newly-hired policemen who have not received the training required by the Ministry of Interior. The solution is a temporary academy that recently opened on FOB Grizzly, near Ashraf. CF and Iraqi SF are working to build a permanent academy in the town of Muradiyah. The academy started its first class April 14, and there are currently more than 400 new policemen enrolled. Twenty police officers from Diyala province and U.S. government contractors with extensive experience in law enforcement are conducting the training. Students and instructors spoke of the work needed to make the academy better, and what will be needed of the police force once CF leave the country. 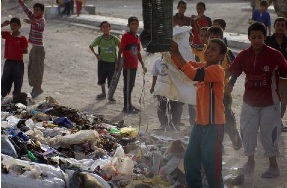 BASRA – The IA Sgt Major of 2nd Bn, motivated the children of the Hyyaniyah district in Basra, to pick up trash from their streets, April 20. He gave the children ice-cream as an incentive. The IA also provided soccer balls and helped make a park for the neighborhood. Additionally, the sgt major delivered a speech to the children about being responsible for keeping one’s streets clean. Iraqi Soldiers reward the children with ice-cream for doing their part in cleaning up the local streets of trash. BAGHDAD – CF found and recovered 12 Iranian-made rocket launchers south of Baghdad following a tip from a local resident, April 23. The rocket launchers, designed for 107mm rockets, were discovered near a reported launch site. This site appeared to be targeting a nearby FOB. Initiation wire attached to the launchers indicated they are of Iranian origin. The same type of wire has been found at previous launch sites. BAGHDAD – The Iraqi Border Patrol, assisted by CF, detained a weapons smuggler and 2 suspected terrorists in the town of Hamdamiyah during a recon patrol April 18 – 22 in the Jazeera Desert. During the op, a suspect admitted to smuggling weapons and bomb-making materials across the Syrian border. He is believed to be the leader of a smuggling cell in the area. Two other individuals were detained for questioning.